Wire for rebuildable atomiser coils. Comes wrapped on a handy spool with slots to trap your wire and keep it from unwinding. Clapton wires are useful for higher power applications where big clouds are desired. 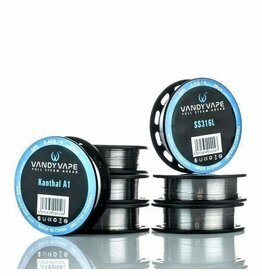 Mesh wire strip for use in the Vandy Vape Mesh 24 RDA as the resistance wire heating element. Creates a very large surface area for maximum performance.